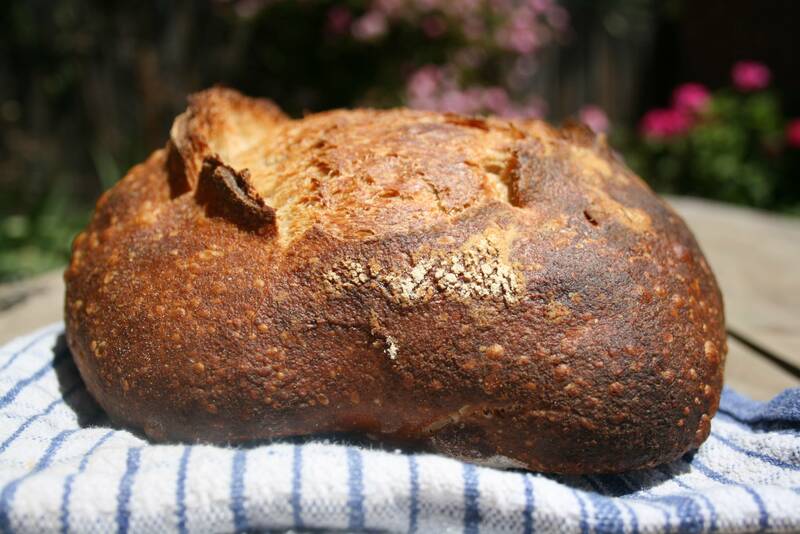 Breaking Bread, an exploration of bread and its many facets. Percentage of flour pre-fermented. 15%. Bulk ferment. 4h30m - 5h. Divide & rest. 20m - 30m. Proof. 12h - 18h, at 8°C. Bake. 265°C, with steam, for 5m, and then 250°C for 35m. Vent, 235°C for 10 - 20m more. Fermentation time. 10 - 12h. Ars, that bread is beautiful... I am strictly a "mom" kinda baker, so don't understand (or even try to) all the formula verbage, but I LOVE good bread and yours looks REALLY good. Hello, Diane, all the breads I have, and will be, baking and sharing on this blog will be baked under identical circumstances to most of the home-baker members of this forum. This particular loaf was made using one bowl, one digital scale, a below-average electric home oven, a pound-cake tin lined with a dusted tea-towel, a quarter sheet-tray with soaked towels, and two baking stones stacked one atop the other. Although much of the content I will soon be sharing may get very technical on this blog, all of it will be distilled. My goal is to show the home baker there is nothing intimidating about bread, and, with some very basic understanding, he or she can began to make bread that tastes exactly as he or she wants without reference to anything other than what he or she has imagined. It's not terribly hard. I started as a home baker, too, and I remain one today. So, I ask you this question: What kind of bread do you want to make, and what is stopping you from making it, whatever the impediment may be? That looks great. I like your extended proofing at the lower temperature rather than retarding the dough completely. 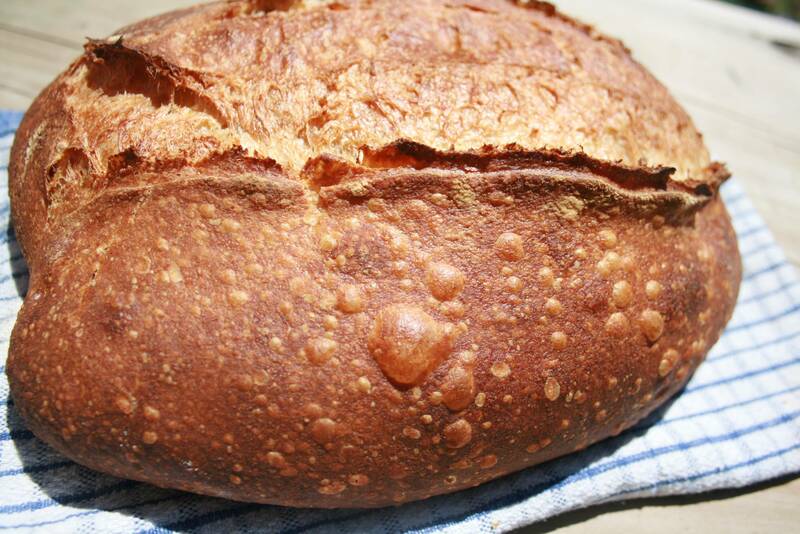 How would you describe the taste, texture, etc of this fine looking bread. Never tried Poujauran or crack! I am eager to make almost any kind of bread... haven't figured out how to get the big holes in the crumb and the blisters on the outside... would like to accomplish that... I have an Electric oven... and a table top roaster... made some really good sourdough in the roaster once. How do I get the blistering? There are numerous ways to achieve blistering, but they all can be best summarised by saying: use lots of water when mixing, and use as little flour when handling. High enzymatic (especially proteolytic) and acid activity in the dough both help as well, as does using as whole a grain as possible. A well-developed and/or well-fermented dough (is there a difference?) really increases your chances. Most bakers will mistakenly tell you the blisters result from retardation, but this is simply not true. What they are confusing is that blistering is more common in retarded loaves than in straight, room-temperature doughs because the water activity increases viscosity as the temperature lowers; that is, water becomes thicker and denser as temperatures decrease. If a dough behaves as though it has less water, then less flour is required to handle it. Hence, perfect conditions for blistering. The doughs I use are extraordinarily wet by commercial standards. I have had stagiaires from Kayser in Paris struggle and not ever get the hang of these kinds of dough. Understand, though, that blistering is overrated. It means nothing about the way a dough was fermented, and that's ultimately what good bread's about. I had to google Jean Luc Poujauran ... I had never heard of him. I seem to live in my own little world. What 80% extraction flour are you using? I haven't had much success sourcing that kind of flour in Brisbane hence I now try to mill my own. Last question ... Is the dough given an initial mix then left alone for the bulk or are you giving it some folds during that time? For mainland Australia and especially for near your neck of the woods, the flour does not get much better than Wholegrain Milling Company, and their Stoneground Organic Light-Sift Wheat. This dough was brought together and developed approximately 30% of the way, and then folds were applied in bulk. Actually the Wholegrain milling Company flour is pretty hard to come by for a home baker up here ... I bought some of their flours a few years ago while on a trip in NSW. From memory I made some nice bread with it. Please note that I only use Tasmanian flours, and this loaf is made using Callington Mill's Stone-ground Organic Whole Wheat and Organic Light-Sift Wheat flours. My salt percentages depend upon the dough-type and function, and the highest amount I use is 2.4% (total flour weight). Despite what most people on here say, that level is still well within what most humans consider to be "acceptable." I use very wet, somewhat underdeveloped doughs, and you'll understand why very soon (I'm putting together a massive post on a bread I make, from start to finish with both photographs and explanations, and it will give you a better sense of my approach.) Salt, being hygroscopic, allows my doughs to "tighten" somewhat, making them somewhat more manageable at room temperature, as I like to use the minimal amount of flour necessary when dividing and shaping. The only bad thing about this salt-level is that it inhibits lactobacilli activity more than I would like, so I usually aim for a much higher final dough temperature than normal (it also comes from the way I build my leavens, and what temperatures they are at, too). Please also note that there are some corrections that should be made to the formula above. Final dough temperature for the starter is 28 degrees Celsius. I'd prefer this dough to have a bulk-fermentation temperature of 26 degrees Celsius, and for the bulk to take place at an ambient temperature. Final dough temperature is somewhat irrelevant, as I autolyse all my doughs (with full flour and water) before adding any thing else. For the way I make this dough in real-life, I usually use a lot longer autolyse (< 12h), all at room temperature. This is perhaps the biggest key to increased flavour that no one talks about (I just discovered this processing parameter myself while re-reading Claudia Thiele's 2003 dissertation; the implications are enormous). I have to do some calculations for different flour-types, as well as figure out the desirable thresholds of the related flavour-compounds released, but I suspect that, once done, most bakers on this site will be astounded by the results, flavour-wise. The only problem with this method is, there are a completely different set of procedures necessary to handle and realise such a "weak," extensible dough, especially in lower-protein flours. I will, eventually, be doing a how-to for my City loaf, too. That'll be way-off in the future, though, after I have moved house. I want to get one up for starters first. Ars, what's the supposed temperature for the bulk fermentation, still 23.5°C? It's the first time that I see such a slow and cold proofing. It's not the kind of bread I'd prepare for myself (I prefer high volume but tiny and imperceptible holes), but it's really good looking. The 23.5°C mentioned above is sort of random, but good eye for detail (please see my reply to Varda's questions about this dough above). I would prefer an ambient bulk temperature of 25 - 26°C. If you want the loaf to be higher, dial back the water by 10 - 14%. For tinier holes, decrease autolyse time to no more than 1h (or just skip it), and shape very tightly coming out of bulk. I normally use "optimal" temperatures for my leavens, and ambient temperature for my base starter and my bulk-fermentation stages. I do not retard every dough, either. Finding this discussion quite interesting ... I love hearing about peoples formulas. A question ... The 25-26C bulk fermentation sounds very similar to what I use. I know you mention that time is irrelevant, but are you still in the 4.30-5hr mark for bulk fermentation for these temperatures? I am currently using 10% pre-fermented flour in a 75% hydration dough and usually aim for a 4 hour bulk ... but ... I give the dough 6 minutes of slap-and-fold mixing before the bulk and then leave it untouched ... if I only stretch-and-folded gently would the amount of time needed for bulk increase? I am with you on the advantages of an extended autolyse ... I usually autolyse for 6hrs while the final levain build is fermenting and have been having delicious success! Flavour in bread comes down to the amount of total volatile aromatic compounds present. These would be anything with odour, i.e., perceived in your nose (versus non-volatile aromatic compounds, some of which can be sensed through other means, like texture or via taste-bud receptors in the mouth). The types of compounds humans associate with, and also find most desirable in, bread mostly originate as free amino acids endogenous to cereal substrates and cereal enzymatic processes (there are other contributors, but these are the principal ones). The more free amino acids there are, the greater the total end-amount of volatile aromatic compounds, quite literally as a substance that can be expressed in mg / kg of flour. Now, Thiele's work is top-notch. 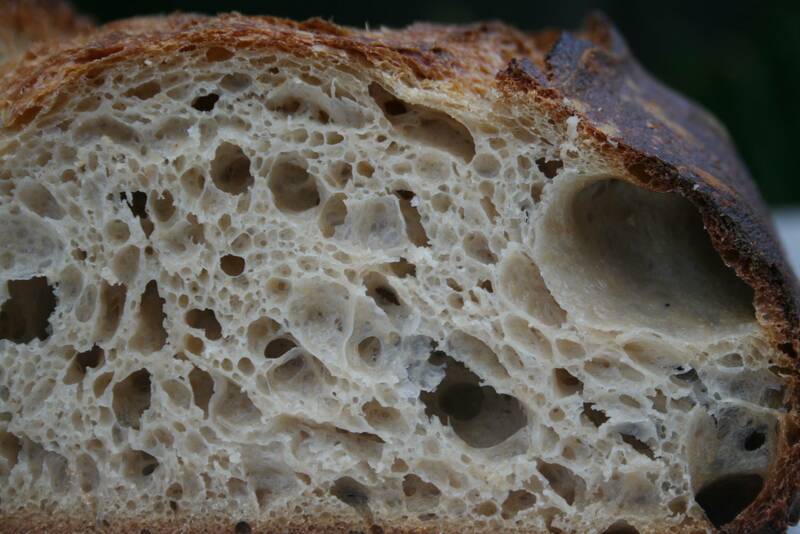 Her stuff is up there with top in this rather limited field, and her dissertation was exploring the effects of sourdough fermentation on proteolytic action, if any, as well as any potential implications for flavour. So, she set up a bunch of control doughs to determine where certain amino acids originate from, and there's something really interesting buried in her figures: not only do these flavour-contributing amino acids originate from sources native to the grain, but the highest total amounts of amino acids came from a dough of just flour and water. More than that, there is a correlative, linear relationship between time and total amino acids produced, with an upward trend continuing and reaching their highest amounts for almost all the amino-acid types produced at the 40-hour mark. Understand that amino acids are only the seeds of flavour. They are expressed as flavour via various enzymatic processes; as sourdough microflora metabolic by-products; and, most influentially, during baking. So, this does in no way provide us a means with "expressing" the flavour potential, but it does give bakers a very easy way to build up total amino-acid counts simply by autolysing for a really, really, really long time. Just in my experiments in the last week, I have found that a minimum of 12-hours for all doughs pretty much makes bread made with sourdough, like, ridiculously good, by an order of magnitude. It makes a much bigger difference than six-hours. Blistering occurs more easily, as does getting that burnished, glossy reddish-brown we all love. There are downsides to autolysing too long (i.e., much, much longer than 12-hours): too weak a dough; no fermentation vigor or tolerance; and, most importantly, the build-up of amino-acid counts that are too high. Many of these amino-acids are precursors for flavours expressed in the crust, and too much of them automatically makes any bake taste of burnt caramel. I just need to figure out what that maximum-time would be, where we reach the critical level of amino acids and still maintain desirable rheological characteristics. It's above twelve hours and it's before forty. We know that much. Have you had any issues with protease or the dough degrading? I have soaked wholewheat flours for that length of time and on rare occasions have had them completely disintergrate and fall apart at mixing stage ... impossible to recover ... I now autolyse/soak them at lower temperatures or with salt added as it inhibits protease activity. I have never tried autolysing a 'white' dough for that length of time though ... and at the moment trying to maintain the ideal temperatures could be a nightmare! After a autolyse of that length would gentle stretch and folds be the ideal way to build strength in the dough? I imagine that any kind of mixing would need to be conducted carefully. she had a plain salted dough as part of her experiment for a control. it had a profoundly less impact on amino acid production, hence why i recommend just flour and water. protease is what you are after, among other things! the rheology considerations are much different but most of my bread looks like the city loaf, and i use this approach. stretching and folding is right, but not just for bulk. also in how you build tension during preshaping and shaping through folds as well. chad robertson uses a similar technique that is not in the book. and i am about to produce a how to series on an all white dough using this technique! I have watched videos of both Chad and his staff shape the loaves there and I cannot seem to get the same results unless I under develop the dough during the bulk stages compared to how I currently mix ... otherwise I have just too much strength. I have experimented with really 'gentle' folding and am more in the ballpark and get a nice balanced tight loaf. It's very different to how I currently shape and will take some practice. it is a play on his, slightly, but all country lor campagne loaves. we are both roughly the same age and raised in tx, but from there the similarities end! ok ... interesting ... regarding your second note point. Here's how I was to maintaining my culture/levain ... it was fed 85% organic white flour and 15% fresh milled grains (usually wheat and spelt) and kept between 55-60% hydration. During summer I add an addition of 1% salt. 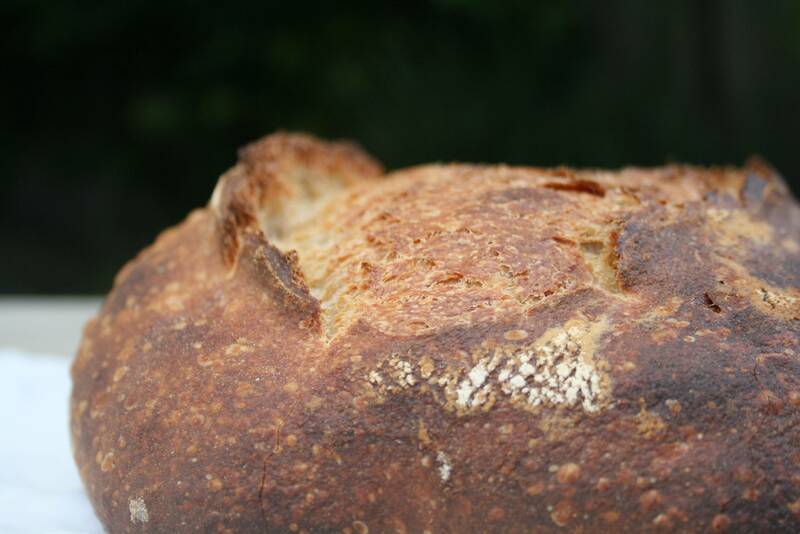 What are your thoughts on salting a levain? ... I have been quite pleased with the results and like the fact the the levain isn't turning to sludge. Leading up to a bake I would build it with an inoculation of 50% and allow it to develop at 26-27C ... usually 5-6 hours. I would do three builds if time allowed - I am trying to keep sourness to a minimum. This takes a lot of time and effort on my part. So the way I maintained it would lead to native-cereal lactobacilli? I am fascinated by this and haven't given it much thought up until now. Well ... an extra hot summer has me dropping back the inoculation to 10-15% and still feeding twice a day with the starter living under the house. The past couple of feeds I have been inspired by your posts and have included larger amounts of fresh milled whole-grains - getting some really interesing aromas now. i am now mixing my autolyse at or before all my levains as well at the same time as my base starter. all mixing at once. Or, how's this for a thought: designating a piece of dough (just flour and water) as an enzymatic pre-ferment. I'd have to calculate what the amount of amino acids needed; the time it takes to produce them; and the minimum dough size one can use for up to 40 hours. This way, it doesn't impact overall dough rheology, if the dough piece that's to be enzymatically pre-fermented isn't too big, but still allows all that free amino-acid content to exist. I really do not have the time to go into detail about why you wouldn't want to ferment this enzymatic pre-ferment, but I can use this metaphor: Chefs do not like to buy pre-seasoned products because they want to be the ones to control the overall seasoning and flavour. It's above twelve hours and it's before forty. Hi ars, is there a chance the autolyse dough might spontaneously ferment when kept at room temp for such an extended period of time? And if it did, even just a little bit, would it matter much? Just wondering. yes it could. it would be negligible. ars pistorica's Recent Blog Entries.